Were external floppy drives for Atari ST and Amiga inter-compatible? 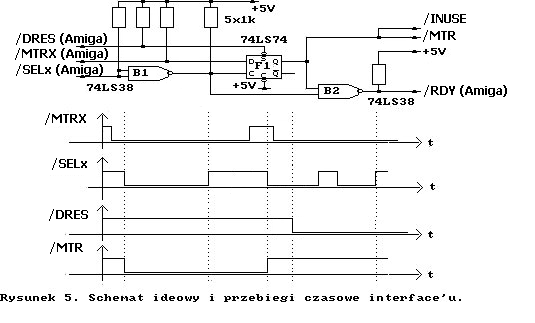 For example, Commodore 1541* had its own serial bus protocol. But what about the external 3.5" DD floppy disk drive on 23pins D-Connector? I would like to have the same one to use both on Atari ST (1040STE) and on my Amigas (500+1200). And finally, what about the Amiga 1010/1011? Could I use it on Atari ST? On both the Amiga and the Atari, external floppy drives don’t contain any “intelligence”, and the connectors are pin-to-pin. However the Amiga uses a 23-pin D connector whereas the Atari ST uses a 14-pin DIN connector, so the external drives aren’t directly compatible, and the drives themselves are setup differently. Nowadays I would use a floppy emulator instead, or a PC floppy with an adapter. In both cases, an adapter such as this one would allow you to use the same drive with either an Amiga or an Atari (as long as you remember to configure the solder jumpers appropriately). The Amiga and Atari ST were not compatible on either the floppy media format or on their floppy drives. The wiring is completely incompatible between the computer and the external floppy drives, most notably because the Amiga external floppy gets power from the computer and the ST external floppy has in built power supply. Also the Amiga disk format is based on 11 sectors/track, whereas the ST uses 9 sectors/track (same as PC-DOS) To my knowledge, there were no manufacturers that ever came out with an external floppy drive to support both machines. My guess would be such a device was prohibitively expensive to produce and there was not much demand. So, then, what are the alternatives? I would say the most convenient and low-cost configuration is an internal Gotek floppy emulator for the ST. Of course, you need an ST originally equipped with an internal floppy drive. The Gotek is a direct swap, and very inexpensive. You can pursue the same solution of replacing the Amiga's internal floppy too, and all models have one. If you want to have the freedom to move the Gotek between multiple ST or multiple Amiga machines, then just acquire an external floppy drive compatible with the machine and swap out its internal floppy mechanism for the Gotek. Really, these Gotek devices are a super solution for both machines. The only difference between them is the firmware loaded and possibly jumper settings. And the compatibility with disk images, and ease of copying between the Gotek and real floppy disks, is basically perfect. While both contain a standard floppy drive mechanism, Amiga external drives also have a control circuit which latches the /MTR signal and detects the drive. Without this circuit an Amiga will not know that the drive is connected or be able to keep the motor going between accesses. To use an Amiga external drive on an ST you could bypass its control circuit with a double pole switch which disconnects it from the /RDY and /MTR lines, and connects /MTR to /MTRX. You would also have to connect an external power supply, and of course make a cable to convert from 14 pin DIN to 23 pin D.
You'll find that the ST floppy drive works well in an Amiga...im using one on an A500 with no modification at all. The only issue is that it has no disk change click as the Amiga does. Not the answer you're looking for? Browse other questions tagged amiga floppy-disk atari commodore atari-st or ask your own question. What were practical uses of SCSI floppy drives?